Subscribe to Emperor's Clothes newsletter! Send this text or the link to a friend. "'We condemn very strongly terrorist actions in Kosovo. The UCK is, without any questions, a terrorist group,' Gelbard said." These buildings were not only treasures of Christianity, masterpieces of an ancient Church; they were also works of art. They belonged to the world. And they were also at the heart of the culture of a people, the much maligned Serbs. Many of these churches had survived 500 years of Muslim rule under the Ottoman Empire. They survived Austrian rule. They survived World War II, when Kosovo was ruled by ethnic Albanian fascists allied with Mussolini and Hitler. They were destroyed under UN/NATO occupation. Before you tell yourself, "It's not NATO's fault. They can't be everywhere," consider this fact: the terrorist KLA has been desecrating churches since NATO moved into Kosovo in June 1999 - that's four and a half years ago. Many churches were attacked more than once. Yet not one terrorist has been arrested, let alone put on trial. Not a single arrest. Why has NATO unleashed its KLA proxies to destroy these exquisite churches? "The [Albanian] nationalists have a two-point platform," according to Becir Hoti, an executive secretary of the Communist Party of Kosovo, "first to establish what they call an ethnically clean Albanian republic and then the merger with Albania to form a greater Albania. " Hitler encouraged the idea of Greater Albania when he put Albanian fascists in power in a large part of the Balkans during World War II; and NATO is following in the Nazis' footsteps today. Meanwhile the churches are destroyed to prove the power of the fascist faction among Albanians, to prove to ordinary Albanians that the fascists have NATO's backing. The fascists tell other Albanians, "See? We eradicate their culture but no one gets jailed. NATO is with us! But publicly we should act violently dissatisfied and demand even more. Then NATO can 'give in' to us!" Perhaps Mr. Clinton was making a cynical joke, attributing to NATO's victims the crimes of NATO's child, the terrorist Kosovo Liberation Army, which has, with the help of NATO and UN officials, destroyed so many of the churches of Kosovo. "... All these barbarous acts by the Albanian extremists have occurred in the presence of the United Nations and International Peace Forces (KFOR), not in a time of war but of peace. The Serbian Orthodox Church and its historical and religious heritage are exposed to systematic destruction and extermination in the very presence of the most powerful armed forces of the world and in the very heart of Europe. "The Kosovo Albanian gangs of looters and arsonists are mercilessly destroying monuments of worldwide renown which survived centuries of turbulent history. With such a systematic campaign against Christianity, civilization and world culture, Kosovo Albanian extremists show that their goal remains an ethnically cleansed Kosovo without Serbs and their Christian monuments." Below is a partial list of churches and monasteries destroyed in five months [as of December 2000, when this information was compiled] by the KLA fascists, protected by NATO. I would like to point out that during the bombing of Yugoslavia, NATO claimed the Serbian government and many ordinary Serbs were driven by hatred of Muslims. But no Mosque was deliberately damaged by Yugoslav forces. 1. The Medieval Holy Trinity Monastery (the church was frescoed) near Musutiste (Suva Reka), 14th century, plundered, set on fire and completely destroyed by explosives. 2. 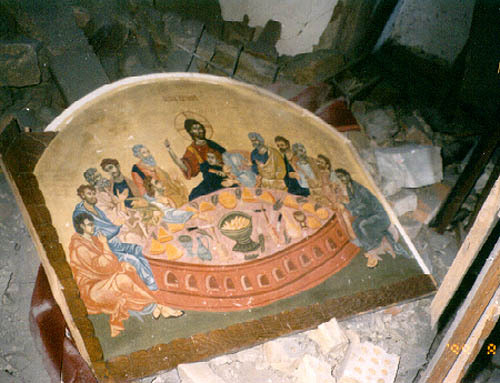 The Medieval church of Dormition of the Mother of God, (painted in frescoes), built in 1315, in Musutiste, burned and afterwards torn down. 3. The Medieval St. Mark's Monastery, near Korisa, Prizren, built in 1467, looted, set on fire and totally destroyed by explosives. The Holy Trinity Monastery near Musutiste. Built in the 14th century, it was looted, burned and soon afterwards blown up, July 1999. That was one month after NATO (KFOR) took over Kosovo. There have been no arrests. 4. 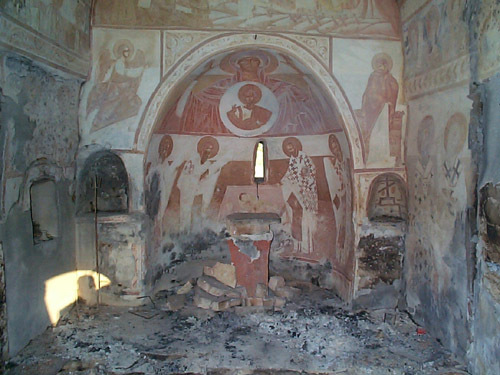 The Medieval Monastery of St. Archangel Gabriel (with frescoes) in Binac village, near Vitina, 14th century, looted and burned. 5. The Medieval Monastery of St. Joannicius of Devic (painted in frescoes), near Srbica, 15th century, demolished and robbed. 6. The Monastery of Dormition - St. Uros (14th century, reconstructed in 1996), Gornja Nerodimlja, blown up with a mine and torn down. 7. The Monastery of St. Archangel (14th century, frescoed, reconstructed in 17th century), Gornja Nerodimlja, set on fire and blown up with a mine, the graveyard has been destroyed, the pine dating from 14th century has been cut down and burned. 8. St. Nicola's church (old church, reconstructed in 1983), Donje Nerodimlje, demolished, set on fire, and blown up with a mine. 9. St. Stephen's church (14th century, reconstructed in 1996), Donje Nerodimlje, situated at the graveyard, demolished, set on fire and blown up with a mine. 10. The Presentation of the Virgin church in Dolac, near Klina, built in 1620, (with frescoes), burned, the Holy Throne demolished, afterwards mined and demolished by explosives. The church of the Holy Virgin Hodegetria was built by Dragoslav, the then chief court governor, and his family, in 1315, in Musutiste, about 10 km southeast of Suva Reka in Kosovo. His inscription above the entrance was one of the oldest and most beautiful Serbian epigraphic texts of its kind. It was an edifice with a semi-dome, had an inscribed cross in the ground plan and a semi-round apse. The wall was built of alternating rows of bricks and stone cubes. The frescoes of the Musutiste School, painted between 1316 and 1320 and famed for their plasticity and the saints' typology, were known as the best examples of Serbian art. That earned them a place in the company of other mature artistic works of the Palaeologus era from the first quarter of the 14th century. 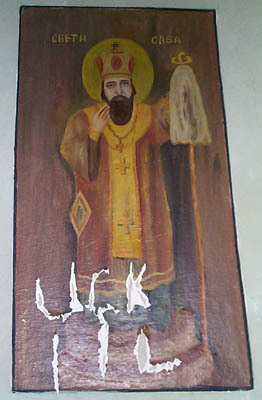 In the altar area there was a unique portrait of the South Slav educator, St Clement of Ohrid. In the northwestern corner of the naos there were figures of holy women, the warriors SS Theodore Tyro and Theodore Stratilates, angels, and St Paneteleimon. Two throne icons of Christ and the Virgin Mary dated back to the year 1603. 11. St. Nicola s church in Slovinje village near Lipljan, founded in the 16th century, reconstructed in the 19th century, utterly destroyed by explosives. 12. St. Apostles Peter and Paul's church in Suva Reka, dating from 1938, demolished and afterwards razed by explosives. 13. 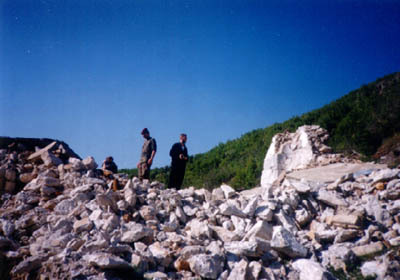 The Holy Trinity church in Petric village, near Pec (from 1993), destroyed by explosives. 14. The Presentation of the Virgin church in Belo Polje (near Pec), from 16th century, reconstructed in 19th century, demolished and set on fire. 15. The Cathedral of St. Uros in Urosevac, built in 1933, demolished, its interior set on fire. 16. The church of St. Elijah the Prophet, in Vucitrn, built in 1834, plundered, demolished and partly burned. 17. The church of St. John the Baptist, Samodreza, near Vucitrn, old church - reconstructed in 1932, demolished, burned and torn down. 18. St Parasceva s (St. Nicola s) church in Drsnik near Pec (frescoed), dating from 16th century, ruined, its interior set on fire. 19. The church of the Most Holy Mother of God in aklo village, near Pec, from 1985, destroyed and burned. St. Elias Church in Smac, near Prizren in Kosovo. Built in 1996, it was damaged by explosives and then vandalized in July 1999. Since these pictures were taken, it has been razed; rubble remains. 20. The Holy Trinity church in Velika Reka village, near Vucitrn, dating from 1997, demolished, set on fire and nearly destroyed. 21. The Holy Apostles church in Petrovce village, near Kosovska Kamenica, demolished and set on fire. 22. The church of the Most Holy Mother of God in Podgorce village, near Vitina, demolished and burned. 23. The church of St. John the Baptist, in Pecka Banja, near Pec, from 1996, demolished, its interior set on fire. 24. The church of the Most Holy Mother of God in Djurakovac, near Pec, built in 1997, demolished. 25. The Cathedral of the Holy Trinity, in Djakovica, built in 1998, vandalized, its interior set on fire, a priceless mosaic over the entrance destroyed, completely razed by explosives (July 24-25, 1999). 26. St. Nicola s church in Osojane village, near Pec, demolished. 27. The church of St. Elijah the Prophet in Bistrazin, between Prizren and Djakovica, reconstructed on the old foundations before 1941, during World War II ruined by Albanian fascists, afterwards reconstructed for the second time in 1988, now completely demolished. 28. St. Demetrius church in Siga, near Pec, reconstructed in 1937 on the medieval foundations, completely razed. 29. St. Elijah s church in Zegra village, near Gnjilane, from 1931, demolished and then completely burned down; the roof collapsed. Also, two church buildings were set on fire, and crosses and tombs in the graveyard were destroyed. 30. The church of the Holy Unmercenaries (old, reconstructed in 1991), Novake - Prizren, demolished and set on fire, the tombs around the church ruined. 31. The parish church in Krusevo, near Pec (old, reconstructed), broken into and partially burned. 32. The Monastery of Sts. Cosma and Damian, the Unmercenary Healers, in Zociste (with frescoes), from the 14th century, looted and demolished, the greatest part of the residential building burned. St. Mark's Monastery in Korisa (near Prizren). Built in 1467. Vandalized and demolished by explosives, July 1999. It is not safe for Serbian people to visit the site. You may recall that NATO bombed a large group of Albanian refugees who had set up camp in a parking lot in Korisa while trying to return home against KLA orders during the NATO war against Yugoslavia in May 1999. 33. 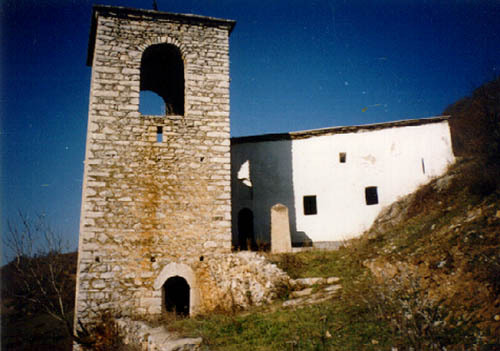 The parish church of St. John, in Grmovo, near Vitina, first set on fire, then completely destroyed by explosives (July 25, 1999). 34. St. Nicola s church in Kijevo, near Klina, built in the 14th century (painted in frescoes), leveled to the ground, crosses and tombs in the graveyard ruined. 35. The church of St. Mark, the Evangelist, (on the foundations of the old church of Presentation of the Virgin) in Klina - Metohia, destroyed by explosives. 36. St. Nicolas church in Ljubizda, near Prizren, from the 16th century, plundered and demolished; the parish center was set on fire. 37. In the same village, Ljubizda, the church of St. Elijah, the Prophet (16th - 17th century), situated at the graveyard, reconstructed on the old foundations, looted, demolished, its interior set on fire, mined, the graveyard around it destroyed. 38. St. Petkas church, in Dobrcane village, between Gnjilane and Kamenica, burned, the roof collapsed. 39. The Cathedral of Christ the Saviour in Pristina (a new one), first the terrorists tried to set it on fire; later, on August 1, 1999, explosives were placed at four sites: two mines exploded, and the other two did not. 40. St. Elijah s church (new, 1994), - Smac village, near Prizren, set on fire, demolished, its interior mined, but not all the explosives exploded. 41. The church of St. Basil the Great (19th century), - Gornja Srbica, near Prizren, burned and torn down. 42. 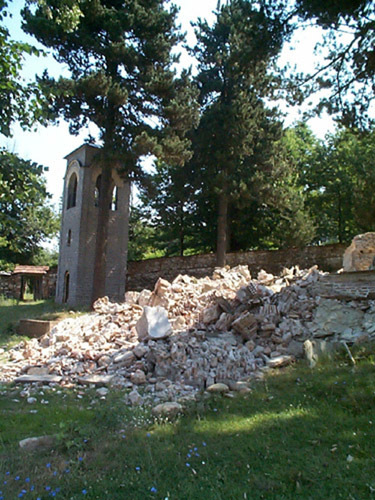 St. Petka s church (recently built), Zaskok village, near Urosevac, blown up with a mine, torn down. 43. St. Nicola s church (old, reconstructed in 1985), Gatnje village, near Urosevac, first wrecked then blown up. The Presentation of the Virgin church in Dolac. Built in 1620. Vandalized and set on fire, July 1999. The altar table was smashed. At the end of August 1999 the church was completely demolished. 44. 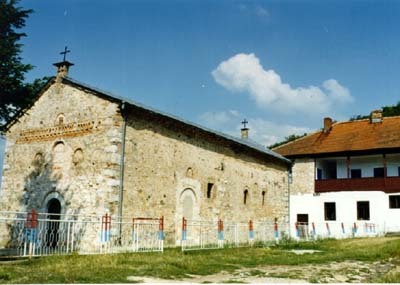 The church of the Most Holy Mother of God (old, reconstructed), in Gornje Nerodimlje, Kosovo; demolished and torn down. 45. St. Elijahs church (broadened in the reconstruction of the old church), in Nekodim village, near Urosevac, demolished and set on fire. 46. The church of the St. Apostles Peter and Paul, in Talinovac, near Urosevac (recently built), vandalized, its interior set on fire, the graveyard around it destroyed. 47. The Holy Trinity church, in Babljak village, near Urosevac, demolished, its interior set on fire. 48. The church of the Nativity of the Mother of God, Softovic village, near Urosevac, demolished and burned. 49. The parish church in Novi Kacanik - destiny unknown. 50. 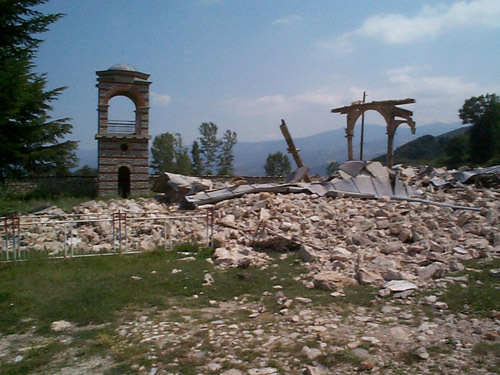 The church of the Protection of the Most Holy Mother of God (old, reconstructed), in Korisa village, near Prizren, razed to the ground, the old site of the church and the graveyard, destroyed. 51. The Church of St Jeremiah in Grebnik was built in 1920 on the base of the ancient church. Around the church were several-hundred-years-old oak-trees and an ancient cemetery. The church was razed to the ground and the terrain was bulldozed over. 52. The Church erected in 1969 in the village of Kos. Stone crosses and tombstones from the old cemetery were wrecked, the church door smashed and the interior vandalized. 53. The Holy Trinity Church in Zitinje. Built in 1980 on the foundations of an old Church. During the restoration an old and damaged inscription was discovered within the ruins of the old church and was built into the new edifice. Damaged. 54. The Church of St. Petka was an old, restored sanctuary in the vicinity of the Serb village of Klokot. Mentioned in writings from 1381. The church interior was burned and on 27 July 1999 it was blown up. 55. The Church of St. Lazarus near the river Belicnica in the village of Belica. Built in the 14th century. Was a single-nave and vaulted church with the remains of the narthex in its front. Around the church are the old and the new cemeteries. 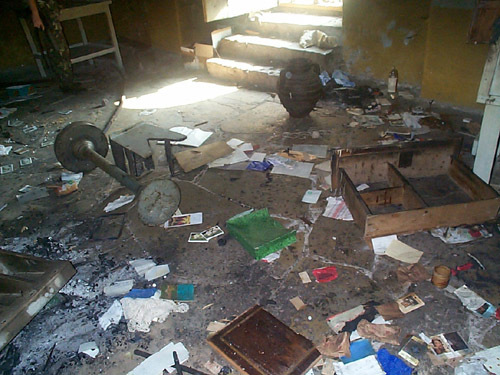 The church was robbed and burned. 56. The Church of the Holy Prophet Elijah in Pomazatin, erected 1937. Pulled down in 1941 but renewed in 1964. During 1982-1985 the doors and windows were wrecked. Since NATO's arrival, the roof and the interiors were burned and parts have been destroyed by mines. 57. The 14th century Church of St. George, in Rudnik was restored in the 16th century. Frescoes date from the same period. The church was destroyed by explosives. 58. 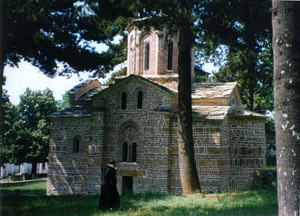 The Holy Trinity Church in Donja Ratisa near Decani was old and underwent restoration in 1935. Albanian fascists destroyed it in 1941 but it was renewed in 1992. Seven attacks were launched on it between 1996 and 1998. Since NATO's arrival it has been burned and completely destroyed with explosive devices. 59. The Church of the Holy Apostle Luke was erected in 1912, in Vitomirci. Built of marble, with one dome. Today the church stands vandalized and burned inside. 60. The Church of St. Elijah in Podujevo. Built in 1930. During World War II Albanian fascists destroyed the dome and desecrated the church. Restoration works were completed in 1971. Vandalized and burned inside. 61. The Church of the Holy Apostles Peter and Paul in the village of Gornja Pakastica. The foundation, dated from the 14th century. The new church, built in 1925 on the old foundations, has been vandalized and partially burned. near Pec in Kosovo. Built in the 16th century. Reconstructed in the 19th century. Looted and set on fire shortly after NATO and the UN took over Kosovo, June 1999. 62. A side chapel was built on the foundations of an old church at the present-day Serbian cemetery in Kosovska Mitrovica. Crosses and tombstones have been vandalized. 63. The Church of the Holy Apostles Peter and Paul. In 1943-1944 the church was used as a prison where the Fascist Albanian regime kept Serbs interned before sending them to work camps in Albania and Italy. Burned and desecrated. 64. The Church of St. Nicholas in Prizren bequeathed by King Dusan to the Monastery of St Archangel in 1348. The church was in service until 1795 when Mahmud-pasha Busatlija looted it. Restored in 1857. The church treasured icons dating back as far as the mid-14th century. It was mined with twenty explosive devices. Five went off. Considerable damage. 65. The Church of the Holy Savior in Dvorani at the foot of Mount Rusnica; included a 1603 icon. Mined. Destroyed. 66. The Church of St. Elijah in the village of Lokvice at the foot of Mount Cvilena. It was built on the foundations of an older church, in 1866. It houses an 18th century icon collection. It was mentioned in writings from the 13th century. Blown up. 67. The Church of Holy Knez Lazar at the Serbian cemetery in Piskote, near Djakovica. The single-dome church was built between 1991-1994 to the designs of the architect Ljubisa Folic. It is partially demolished. The parochial home was burned. 68. The Church of St. Petka stood once in Binac. A new church was built on the old foundations at the cemetery, in 1973. The terrorist KLA destroyed it with explosives. 69. The Church of St. Petka in Gojbulja, at the foot of Mount Kopaonik. The new church was built at the village cemetery, on the remains of an ancient, 1-2 m high wall, in August 1986. The preserved arch, which vaulted the western narthex, was added, too. The old walls had traces of fresco plaster on them. There are also the remains of an old Serb cemetery from the first half of the 18th century. All desecrated. 70. The Church of St Nicholas in Stimlje, at the foot of mount Crnoljeva. Desecrated. 71. The church of St. Archangel, on a hill above Stimlje. It was built between 1920-1922 on the foundations of an older church. Thoroughly renovated in 1977, today it stands desecrated. 72. The Church of the Holy Saviour in Meciceva Mahala at the foot of Mount Ikona. Looted and burned. 73. The Church of St. Petka, west of the village of Musutiste. Looted and burned. 74. The Church of St Archangel, in Musutiste. Burned and partially demolished. The Parish Church of the Apostles Peter and Paul in Suva Reka. Built in 1938. Vandalized and later blown up by the KLA, July 1999. * "Nightmare by Design: How NATO Changed a Kosovo Town into a Racist Hell - Interviews with three Serbian women from Kosovo..." This article should be read by every citizen from a NATO country. * The accusation that NATO is presiding over terror in Kosovo is not an exaggeration; it is the plain truth. Everyone should read the interviews in "Nightmare by Design: How NATO Changed a Kosovo Town into a Racist Hell - Interviews with three Serbian women from Kosovo..." Every citizen from a NATO country should know what is being done in his or her name. In our opinion, this is essentially what NATO has in mind for Israel. * Discussed the creation of an imaginary character, the genocidal 'Media Milosevic. * In this second interview with Cedomir Prlincevic, the historian and Jewish leader driven from Kosovo, Mr. Prlincevic charges that the supposed expulsion of Albanians during the bombing was a fraud, staged for the camera.